Please join us in welcoming new additions to our team! 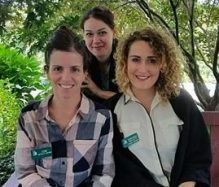 Adrianna Alpaugh, our new Director of Social Services and Karen Levy, our new Independent Living Activities Facilitator and Goni Rubel Zlotnik, Activities Intern who all joined Springhouse Senior Living in September. Adrianna joins us after completing her Masters in Social Work at Boston College and several years of working with various organizations serving elders in Massachusetts, Vermont and Pennsylvania. She started her career at a senior living community in their dining department in 2005 then worked as a CNA throughout college. When Adrianna moved to Boston, she gained further experience working as an activity coordinator in a specialized dementia care community. While working towards her master’s degree, she interned at a geriatric psychiatry department within a local hospital in addition to a care management agency. She brings us many different perspectives from all of her varied experiences. Karen Levy is no stranger to Springhouse, as she has been offering her massage therapy services here since last fall. In addition to her certification and training in massage therapy, Karen holds a degree in Digital Media Production and Filmmaking from New England Art Institute and has spent fifteen years working as a freelance artist in various capacities. We believe her background and training in the arts as well as her passion for healthcare and lifelong education will prove invaluable to our community. We would also like to take this opportunity to introduce our new Expressive Therapy Intern for the 2018-2019 academic year. Goni Rubel-Zlotnik is a first-year student in Lesley University’s Expressive Therapy and Mental Health Counseling graduate program. Goni specializes in Dance Therapy. She will be leading dance/movement groups with our residents as well as meeting with residents individually. Goni moved to the Boston area from Israel in 2015. We are excited to learn about Israeli cultures.